For those without comedic tastes, the self-proclaimed experts at Wikipedia have an article about Geoffrey Boycott. Geoffrey Boycott is a cricket player/commentator who is well known for his (unprovoked assaults on women), courteous manner towards the cricket ball, and ability to reach a century slower than any other cricketer before him, a talent surely passed onto him by his Grandmother. Geoffrey Boycott has a reputation for being kinder to cricket balls than people - he was quite content to let the ball hit his bat, rather than him hit the ball. But as Geoffrey would say: "Ye don't get runs by being nice." Boycott was to entertaining batting what Mao Zedong was to peaceful leadership. 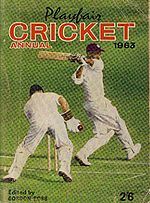 3 Boycott on how to run between wickets, or "Wickiitts"
He began playing cricket when the curt Henry Blofeld called Boycott a "wimp" and challenged him to fill in for the England team. Boycott, at the age of 19 on his England debut hit a century the following afternoon, off 449 balls, a record he would continually smash throughout his career. During one match, he hit a six out of the ground, which knocked Henry Blofeld off his bike and ended any chance of the unrefined lout having a cricket career. Need we not say that Blofeld was the inventor of sledging after calling Cambridge I's wicketkeeper, Sir Hubert Winstanley-Smythe-Arbuthnot-Pepperpot-I'll-Have-Cream-Cakes-and-Quail's-Eggs Johnston a "dear old thing". Boycott rallied against sledging throughout his career, though how he'd managed to do that without sledging back is another question. Blofeld took up a career in commentating on cricket, where he can safely sledge players (and birds) without any fear of reprisals. However, an incident involving Boycott's mother and the up-and-coming batsman occurred when he was discussing cricket with his mother in preparation for the West Indies test. Geoff was worried about how to play against spin, as the West Indies had Lance Gibbs in their attack, who had already got 100 wickets in one match (a statistical anomaly). He asked his mother: "Mam, how am I going to play against leg breaks? ", leg breaks being a common spinners delivery that spin from leg stump to off stump. His mother replied in kind: "Well son, we'll soon find out!" She then brandished a hammer and proceeded to break his leg, causing Geoff to scream in agony. He shouted horrendous abuse at his mother, who started to cry: "I only wanted to help you dear Geoff, you wanted to know about leg breaks, so I thought if you had one you would know better than anyone!" Rather like the wicket which Geoff defended on several occasions, his right leg started to resemble a stump. Suffice to say, Boycott's mother did help him, as he became a great player of spin bowling, though he'd never thank his mother in public, he would always put it down to a thing he called "Prack-tiss". His mother also offered him 'pulling tips', because she was sick of having him around the house and was hoping Geoff would settle down and marry a woman who took his fancy - however poor old Geoff misinterpreted this advice, thinking his mother was giving him advice about how to play the pull shot. It was a shot Boycott played well, and this led to a further temporary rift between the two. Boycott on how to run between wickets, or "Wickiitts"
You daft knacker, you haven't even learnt how to hit the ball yet! Go home, and learn that before I have anything to do with you. You say you've learnt how to bat, but have you seen the state of this pitch? It's as rough as owt: You wouldn't get my grandmother anywhere near this pitch. I'm even reluctant to stick my key in it! Its not a good day for batting, or running between wickets. Oh well, for the purposes of this example. If you're playing against the West Indies, don't even bother running. Run out of the way mebbe. You're gonna be out shortly anyway lad. Right, let's assume you've 'it the ball through the covers then, and not into me mother's pinny, and are ready to run. You've got to run fast, but not too fast, because if you play like I teach you to play, you won't be hitting a lot of boundaries, but it's best if you treat the cricket ball like a former lover - give it a good smack. Errr, forget I said that last part. I never hit her, 'onest. It's all a load of roobish. Now where were we? By heck, you'd be run-out if you haven't reached the other set of wickets by now. They're not stupid are these West Indians y'know? I'm sorry, have I rubbed you up the wrong way? I'm not meant to be Mahatma-bleeding-Gandhi (I played against 'im in the last test, but I wouldn't have let him on the pitch wearing a baby's nappy). This is test cricket, after all. I'd best be heading home, my mother's cooking a lamb stew tonight. Can't miss that lad, can't miss that. It is thought that Inzamam-ul-Haq never read this book. Geoff meantime discovered a cunning way of getting out of playing gruelingly slow test matches. Because Boycott was quite an oldish cricketer (he had many different opening partners, but preferred Gooch the best - perhaps it was the bushy moustache) he decided to commission a sculptor to create a likeness of himself, which he would be able to then place at the crease, and which would be as difficult to dismiss as Geoffrey. This statue actually averaged more runs than Geoffrey, though this was because the bowlers became so infuriated at trying to bowl the statue out that they bowled many wides and no-balls. When it was discovered that Geoff was off playing golf while the statue was doing all the hard work, he was dropped from the squad. Boycott lost his place in the Test squad. His sculpted likeness went on to play World Series Cricket for Kerry Packer, but after Jeff Thomson bowled five 90mph+ bouncers at the statue, it eventually smashed on the pitch. Boycott regained a place after promising to play faster, but in his first innings, he was at the centre of a media-storm when he hooked a delivery from a West Indian bowler for six. This type of shot was banned under the laws of cricket after the infamous series many years ago when the players hooked so many sixes in one test that the cricket ball as an object was almost extinct. Boycott was accused of breaking the laws of the game, of 'assaulting the cricket ball in an ungentlemanly manner'. Boycott claimed that he had never meant to hit the ball for six, but that he was simply defending himself from the bouncer that Roberts had bowled. He said: "I'm not the hooking sort". Boycott was found guilty by the ICC and banned from the game forever. Ray Illingworth, then chairman of selectors for England Cricket, vouched for Boycott in saying: 'He was always a straight player' - though it later emerged that Illy was referring to his batting technique, and not his character. Boycott's career was in jeopardy after this incident, and he would not play for England again. The ball which the cricketer had hit for six (see picture), was awarded damages to the sum of a new lacquer and restitching of the seam. 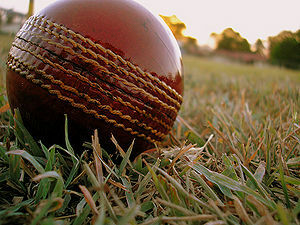 The ball, has since died in 1996 at the age of 56 overs; it was 40 overs old at the time of assault, a similar age to Boycott. This page was last edited on 11 September 2012, at 02:33.